The Brooklyn Autumn Guitar Show 2 Is Coming In September!!! Attention guitar players, six-string slinging fans and music aficianados everywhere – The Brooklyn Autumn Guitar Show “2” is heading your way!!!! This fun event is hosted by Lisa Sharken and D.J. Uncle Mike and will once again take place at The Brooklyn Bowl in Williamsburg, Brooklyn. 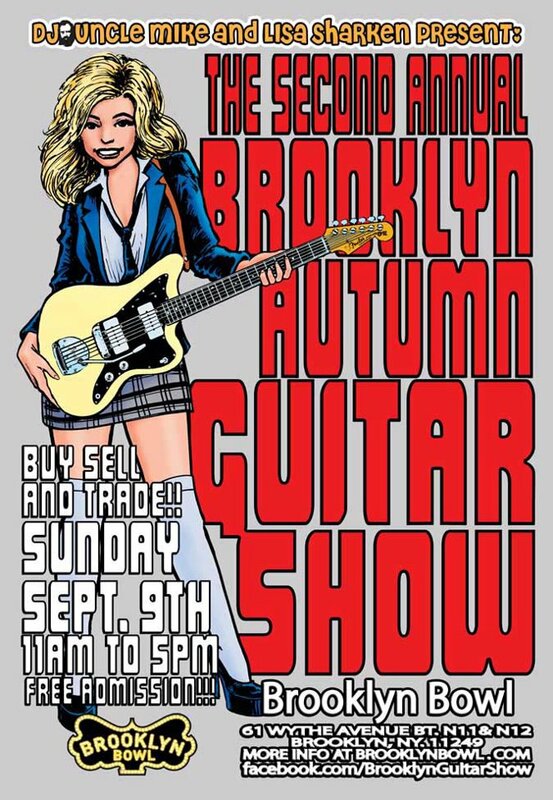 This is the fourth show of its kind since April 2011 and will be the 2nd Annual Brooklyn Autumn Guitar Show. Resident musicians might be interested in knowing how this is primarily a local show and nearly everyone who displays at the it is from the area with a few travelling from other states and even other countries to attend. Scheduled Returning Vendors Include: Main Drag, Southside Guitars, My Generation Guitars, First Fret Guitars, Rivington Guitars, Mountain Cat Guitars, Rudy’s; several builders and manufacturers from the area including Cobra Guitars, La Bella Strings, DR Strings, Phil Jones Bass, Sheridan Basses, Hahn Guitars, Louis Electric, Pigtronix effects; and a few private sellers displaying used and vintage instruments from their own collections. First Time Show Attendees Include: Fuchs Audio and DGN Custom Guitars and several more. To RSVP For This Brooklyn Springtime Guitar Show you can click the Official Invite HERE and also “Like” the Facebook Page which I have linked below for your consumption. Awesome Lisa!! I will be there I will be jamming on some Xotic pedals at the Phil Jones Bass booth ! !